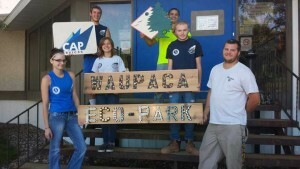 Eco-Park dedication set for September 10 – CAP Services Inc.
CAP Services’ Fresh Start Program participants pose with the Waupaca Eco-Park sign outside the CAP Services offices in Waupaca. A public dedication celebration will be held Sept. 10 at Eco-Park, which is located on city-owned parkland adjacent to the Eastgate Estates subdivision on the city’s east side. 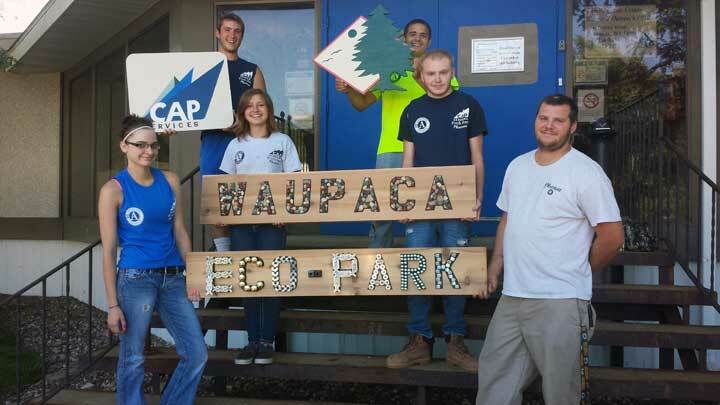 CAP Services, the City of Waupaca and project partners will hold a dedication celebration for the new Waupaca Eco-Park at 1534 Webster Way near the Eastgate Estates subdivision. The celebration will be from 10:30 a.m. to 1:30 p.m. Saturday, September 10. The celebration will feature all-ages environmental science activities, park tours and a 12 noon dedication ceremony with project partners and supporters including the Waupaca Foundry, Faulks Bros. Construction, Torborgs Lumber, North Wind Renewable Energy, the Community Foundation for the Fox Valley Region, CellCom and the Waupaca Area Community Foundation. A special dedication of the 250-seat natural amphitheater will be made in the name of Connie Abert, a lifetime environmental educator with UW-Extension who has helped extensively with the planning of Eco-Park. Concessions including brats, hamburgers, veggie burgers, hot dogs, chips, and drinks will be available for purchase. 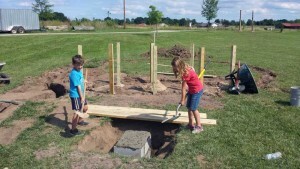 Community volunteers lay the groundwork for the natural children’s playground at Waupaca’s Eco-Park in early August. The completed playground will be among several park amenities on display at Eco-Park’s dedication ceremony Saturday, Sept. 10. Community volunteers and Fresh Start crews, who also build homes in the Eastgate Estates subdivision, built most of the park’s components including its open air shelter, environmental education center, amphitheater, and natural children’s playground. The Fresh Start Program takes disadvantaged, at-risk, and drop-out youth, as well as young people who have been in trouble with the law, and teaches them construction skills, life skills, and employability skills while helping them complete their educational goals.